Put down the fork is what you will have to keep telling yourself once you take a bite of this. Once it's down just pick it up with your hands and enjoy. Recently we purchased a learning tower for my son, he has enjoyed making eggs in the morning and peanut butter sandwiches for lunch. He has also loved that there is a chalkboard on the back of it to draw on. After nap one day last week I had everything set up for us to make Pumpkin Bread. This boy is a lover of pumpkin bread like his mama, and often times will pass up a cake pop at Starbucks for a warm loaf of pumpkin bread on our journey through Target. I knew I wanted some type of crumb topping--because who can really resist a buttery sugary goodness crumbled on top of your bread. I actually made way to much of it, but hey it was heavenly. 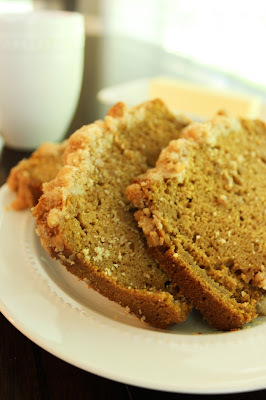 The recipe below has a decrease in the crumb topping but feel free to add more if you'd like! 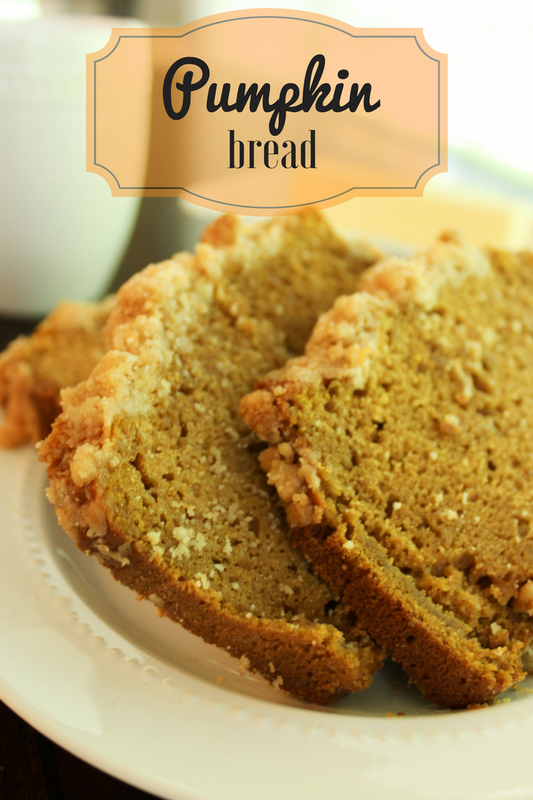 Grab a cup of coffee and a warm slice of this bread and you are sure to forget that it's 90 degrees outside! 1. Preheat oven to 350 degrees F. Grease one 9x5" loaf pan. 2. In a large bowl combine the flour, sugars, pumpkin pie spice, baking soda, and salt. 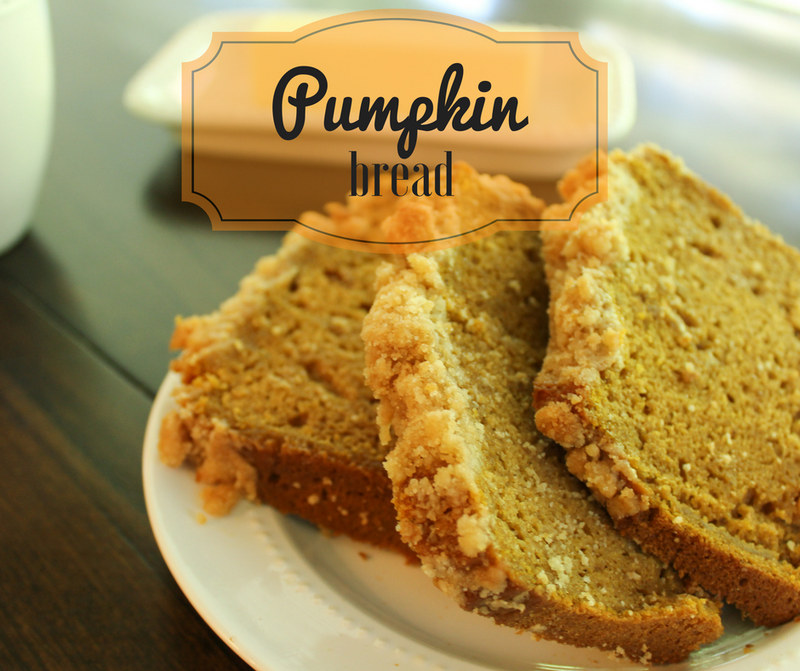 To make the crumb topping--in a separate bowl combine the flour, sugars, pumpkin pie spice, and butter. 3. In a separate bowl whisk the eggs, pumpkin puree, butter, vanilla, and buttermilk. 4. Add the wet ingredients to the dry ingredients, and mix using a rubber spatula until moist. 5. Pour the batter into the prepared loaf pan. Sprinkle the crumb topping over the loaf, pressing down gently into the batter. 6. Bake for 50-60 minutes, or until a toothpick comes out clean. Let cool before removing from the pan. What do you like to make with your kiddos? Ohh I just made a similar Pumpkin Pie Spiced Coffee Cake! Mine wont' be up until next week. I want ALL the pumpkin in every version out there! I need to go make this RIGHT NOW. Looks amazing!! Thanks for sharing, mama! I've pinned this and plan to make it next weekend while I'm decorating for Fall. Thanks for the tasty treat idea.